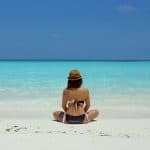 Whether you’re new to tanning or you’ve been to a few sessions, everyone has the worry that their tan just won’t look as natural as they’d like. Maybe this fear was influenced by a former tanning experience, or maybe you just laughed at Ross’s terrible tan in that one Friends episode, but either way, you can’t shake the thought. With airbrush tanning, you can put those worries to ease. We’re not here for the dramatic — we’re here for the natural glow and healing look of the sun. With our airbrush tanning process, you have the choice of a subtle hint of sun or a shade that looks like you just got back from an all-day romp on the beach. When you choose a sunless tan, you are choosing the art of the glow. We care about the effects of tanning, so our special formula is designed to both nourish and beautify the look of your skin. When you leave our airbrush tanning sessions, not only will you feel confident, but our solutions will work to give your skin an inherent glow, even after the shade wears off. With a tan that is both fast-drying and long-lasting, our airbrush process is the ideal choice for beginners or anyone on the go. Big trip coming up? Our tans will last for 5-7 days with the proper care, and you’ll only need to wait 8 hours before dipping in water. By the time you’re off the plane and on Cozumel beaches, your tan will be ready to shine.